The accounts tab is where you create and manage accounts. Tap the button in the nav bar to create an account. You'll be presented with a form to fill in the accounts details. Enter the accounts name and balance. Then choose the account type and optionally add a URL to access the account online. 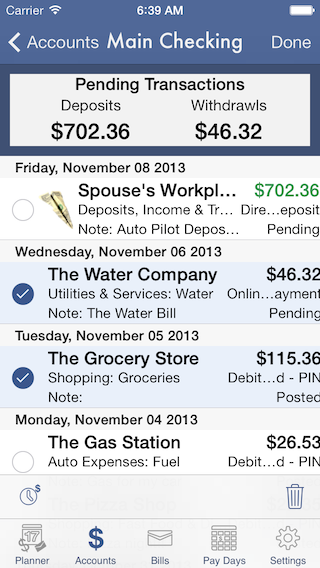 Tap an account in the list and you'll get a view of the transactions in the account. At the top you'll see the accounts current balance. When the reconciler is enable the balance can be swiped over to reveal the totals of transactions in the various reconciler states, Pending, Posted & Uncleared. Tapping the totals for these states will filter the list to only transactions in that state. 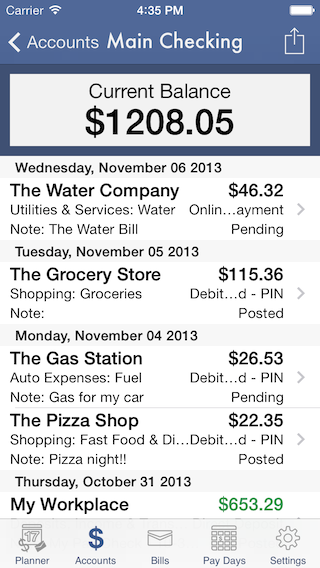 Swipe back to the current balance and tap again to restore the full list. Visit the Transactions page to learn more about adding and editing transactions.